Our criminal defense law firm always wants to make sure that its client’s, their families and their friends have the most up to date information about their Constitutional Rights in Pennsylvania and New Jersey. This blog specifically focuses on the areas of illegal drugs (narcotics), firearms (guns), and drunk driving (DUI/DWI) defense, along with violent crimes such as aggravated assault, simple assault, and terroristic threats. As I have stated in my previous posts, my free books and videos, many criminal investigations begin with a search of a person’s belongings either in their car or their home. Always keep in mind that the search of a car is much different than the search of a home, as there are much less Constitutional protections in the search of a vehicle, even in Pennsylvania where the case of Commonwealth v. Gary (2014), has substantially reduced the further Constitutional protections that Pennsylvania’s Commonwealth provided in addition to the protections of the 4th and 14th Amendments to the United States Constitution. Many people travel with their prescriptions and it’s not uncommon to see people consuming or swallowing pills and other medications in their car or while using public transit. One of the biggest questions that our law firm receives is whether a pill bottle (usually amber in color) is enough to provide police with probable cause to search a vehicle. Remember that the search of a vehicle usually does not requiresearch warrant especially since the Gary case, but the search of a home provides a much different expectation of privacy and so a warrant is required for the search of a residence. From my previous blogs you will recall that the Commonwealth v. Gary case states that police may search a vehicle if they believe that it contains contraband based simply off the inherent mobility of the car and no further exigency is required. 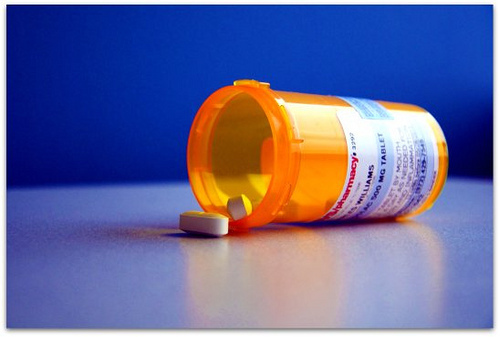 There are many situations however, where a person’s pill bottle isn’t in their purse, luggage, or bag, but simply resting on the passenger seat or in the console, as many people take these drugs as they travel to work or simply leave them out to avoid forgetting to take the medications, which are often necessary for them to complete their daily living tasks. If you are stopped by police, I would recommend being polite but never giving the police officer consent to search you or your vehicle, even if the police officer tells you that he doesn’t need a search warrant for any of it. Again, not giving consent doesn’t mean being disrespectful to the officer, but simply politely telling him that he is not permitted to do so. If the officer proceeds with the search, do not attempt to stop him or get into an argument with him or her. This will never help your criminal case and will simply add an unnecessary level of complication to it. Pill bottles, in and of themselves; do not constitute probable cause to search a car, either under the Com v. Gary cases or under the Plain View Doctrine, which is also another exception to the search warrant requirement. Plain view basically means that a police officer can initiate entry into a home or a vehicle based on his observation of an illegal item (contraband) in order to confiscate it. Simply seeing a pill bottle is not probable cause since such packaging (amber bottle) is commonly used for other lawful purposes and is, therefore, not per say contraband! There is even Pennsylvania case law that says seeing pill bottles with full and partial labels does not constitute either probable cause or the plain view exception to the search warrant requirement. What about clear sandwich baggies, reasonable suspicion, and probable cause? There is also case law in Pennsylvania which says that clear Ziploc baggies detected during a pat down search of a suspect is not per say contraband that would justify the further search of a suspect’s pockets, as the baggy in and of itself isn’t contraband (illegal item). Further, the presence of pills within that same Ziploc baggy, following a traffic stop, again would not provide the police officer with probable cause to search the car, even under Gary, because he or she would need more to justify the search. Remember that there is a difference between probable cause and reasonable suspicion. Reasonable suspicion is a lesser form of probable cause and would allow the officer to conduct a Stop and Frisk of a suspect, but not necessarily allow the officer to search the suspect if he or she cannot articulate that their search revealed some type of contraband (drugs) or an item that could harm the officer (weapon). For more information on illegal searches and seizures, I encourage you to visit my free download section and check out my book, What Everyone Should Know About Guns, Drugs & Defense Lawyers in Pennsylvania!